I subscribe to Crunchyroll, Funimation, and Daisuki. Though I like all three, and I would recommend any of them to anime fans, my favorite is Crunchyroll. Expect that most of the series I review will be from there. From my perspective, not only does Crunchyroll offer the best selection, it also streams reliably even when the other two don’t. I hope net neutrality addresses that problem, but until then, I have to deal with reality as it is! Charlotte: A series about adolescents who manifest paranormal powers that disappear during adulthood. This one is surprising me with its depth and characters. Classroom Crisis: Deals with an advanced R&D class who looses senior management’s support. We’re up to episode 6, and I’m considering dropping this series. 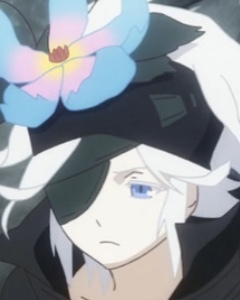 I really like Rokka’s character designs. Picture from Crunchyroll’s stream. Follows the exploits of a group of six (or seven!) heroes who are chosen to protect the world against the Evil God. The solid characters and beautiful have surpassed my expectations! And I’m not just saying that because one of the braves dresses as a bunny girl (with lethal blades). Kidding aside, the mystery aspect is keeping my interest, and the animation is beautiful. Actually, I Am: This is another series that has surpassed my expectations. The story centers on a young man who can’t keep a secret. He discovers that his crush is actually a vampire, and he must keep the secret or she’ll have to leave. I’m enjoying the story and the humor. My Wife is the Student Council President: Note that the link requires a log in. I’m trying to figure out if I want to keep watching this or not. There’s a story about acceptance and tolerance, but it’s kinda mixed up with soft-core imagery (for Crunchyroll members), which is okay if it fits the story. So far, it’s working. But I’m still not sure where it’s going. I’m not saying it’s not entertaining! Gate: This is far and away my favorite series of the new season. The concept is that a dimension inhabited by fantasy characters like orcs, elves, and the like attacks Japan via an inter-dimensional Gate. Of course, the Self Defense Force (SDF) defends and pushes the battle into the fantasy world. The main character, Itami, is an anime fan, so he’s completely prepared for this world. I just watched the fifth episode (the sixth is due in days). The plot treats the characters AND viewers as adults. The narrative treats implications of a sword/sorcery world trying to attack the SDF realistically. So far, my favorite character this season (sorry Itami!) is Rory Mercury. Monster Musume Every Day Life with Monster Girls: This is one of those series where if people ask me in person, I pretend not to know what the heck they’re asking about! The premise is that a hapless young man is playing host to women from realms humans used to consider monsters. His first house guest, Miia, is a Lamia, who sports the torso of a woman and the bottom of a snake. Parts of this series are undeniably soft-core, which is why I’d pretend not to know this series. What I like about it is it tries to portray a realistic view of how a human might try to interact with a Lamia, Centaur, and other mythical beasts. School-Live: At first, this didn’t seem interesting to me. If I’m going to watch school-based shows, I prefer something like Chrome Shelled Regios. Then I saw a meme called PTSD: The Series. I don’t want to spoil the setup for anyone: just watch the first episode. It blew me away. The little hints that began in the background about 1/2 way through set the stage. I’m interested! I’ll try to enumerate the series I’m watching on Funimation in my next post.